Elysian Auto Service strives to treat every customer with respect, top-quality service, honesty and outstanding customer services. We will fix your vehicle right in a timely manner. We guarantee to give you the very best service in Southern Minnesota. Our goal is that every customer leaves feeling satisfied with the service they received and would be willing to recommend us to family and friends. 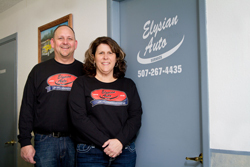 Elysian Auto Service has been family owned and operated since 1984. Elysian Auto Service believes that honesty and service is our most important job. We know how important it is to drive a safe and dependable vehicle because it transports your most precious cargo: Your Family! Let us help you transport your family safely by professionally maintaining your vehicles. Elysian Auto Service has a free pick up and/or delivery service and courtesy cars available upon request. You can drop off your vehicle and continue on with your busy day and stop after work to pick up your completed vehicle: Hassle Free! Elysian Auto Service has been named an Approved Auto Repair (AAR) facility by the AAA. To qualify for the AAR designation, a repair facility must meet AAA's strict criteria for technician certification and customer satisfaction. The shop must be certified in eight categories of expertise. In addition, the shop must employ Automotive Service Excellece (ASE) certified technicians and have an excellent performance record and a good community reputation. AAA Approved Auto Repair benefits all motorists by identifying superior auto repair shops. AAR facilities offer a 12-month/12,000-mile warranty on most jobs. AAA continuously monitors the performance of AAR facilities to insure that the standards are maintained. Currently, there are 140 AAR shops in Minnesota. Elysian Auto Service is proud to have its name on the list. Elysian Auto Service has earned the title of Top Shop Award Winner 2014 for the seventh year. Elysian Auto Service is the only Top Shop Award Winner in Faribault, Morristown, Waterville, Waseca, Janesville, Madison Lake, Elysian, Cleveland, Kilkenny, Morristown, Owatonna and LeCenter, Minnesota. Each year, the AAA Clubs of Minnesota recognize a select number of Approved Auto Repair (AAR) facilities for their business integrity, professional standards in automotive repair, outstanding customer service and community involvement. In Minnesota, 18 Approved Auto Repair shops have earned the Top Shop honor for 2014. The 17th annual Top Shop awards are given to those repair facilities that last year had the required number of online customer satisfaction surveys with an Excellent rating of 93% or above. The evaluations are monitored and processed by AAA. Top Shop recipients are also Total Repair Care (TRC) facilities that offer the SYC&S Discount to Members. A TRC shop will triage, diagnose, or repair a member's vehicle within one hour of arrival at their shop. AAA requires these facilities to demonstrate their highest level of commitment to their customers by having a staff member certified: ASE Master A1-A8, ASE Advanced Engine Performance L-1, ASE Certified Service Advisor C-1. Currently, 114 auto dealers and independent facilities in Minnesota participate in AAA's AAR program. To qualify, a repair facility must meet AAA's strict criteria for technician certification and customer satisfaction. The shop must be certified in four categories of expertise including engine performance, minor engine repair, brakes, and electrical systems. In addition, the shop must employ Automotive Service Excellence (ASE) certified technicians, maintain an excellent performance record, and a good community reputation. Although AAR benefits all motorists by identifying superior auto repair shops, AAA members receive additional benefits from AAR facilities including a special 24-month/24,000 mile warranty. In addition, AAA auto repair experts investigate and resolve any dispute involving an AAR facility and an AAA member. AAA continuously monitors the performance of AAR facilities to insure that standards are maintained. Elysian Auto Service is a family owned auto repair facility in our area. We are completely customer driven. We don't answer to a district manager... we answer to YOU. For over 47 years, the Lakes Region has been our home. Its citizens have been our friends and neighbors. We continually strive to earn the trust and confidence of our community on a daily basis. We are caring for the Southern MN Lakes Region one car at a time. Southern MN Lakes Region includes Elysian, Cleveland, Madison Lake, Janesville, Waterville, Waseca, Morristown, Eagle Lake, Mankato and more. Check out the videos of Elysian Auto on the news and in the media!